Hammertoe is a condition that occurs in the second, third or fourth toes. Typically the middle joint in the toe is contracted, causing the toe to resemble a hammer. Hammertoes can lead to corns or calluses due to rubbing against the shoe, in addition to severe pressure and pain in the toe. 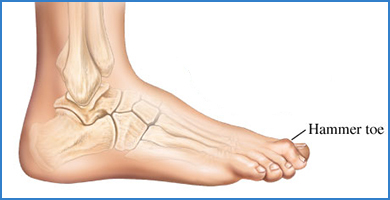 The leading causes of hammertoe include muscle imbalance, arthritis and improperly fitting shoes. Treatment for hammertoe involves wearing shoes with soft and roomy toe boxes so there is less friction against the toes. Toe exercises to stretch and strengthen the muscles are also recommended. In some cases, surgery may be recommended to correct the condition.